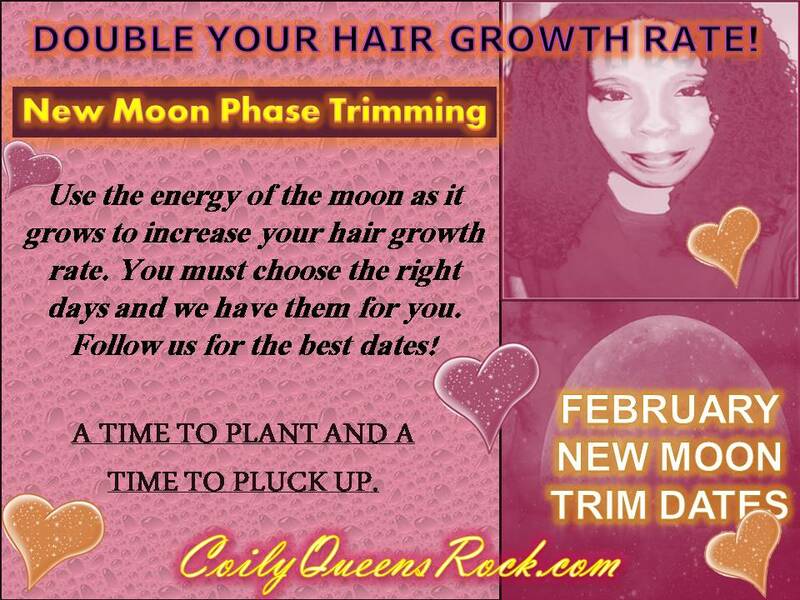 CoilyQueens™ : New Moon Phase best trim dates for February! Grow hair fast! New Moon Phase best trim dates for February! Grow hair fast! What you love will grow! What you love you show! Only 5 good trim days for February! Concentrate on falling more in love with your beautiful blessed hair. February is the month we put more energy into what we love. Feed your hair some of that love. Come out of those crochet braids! Stop hiding behind those wigs! Start loving your hair more and watch it flourish! Hi Vee, I have been using your regimen for my little girl since December and did the New moon trim on her hair in January. Her hair has improved so much, wash days are easier and styling is easier. The finger combing and detangling has led to less breakage toward her ends I've also been able to do easier(less time) hairstyles due to the growth I've seen. The one problem I'm having is shorter hairs close to her roots from breakage, she doesn't have any baldness, but the broken hairs are hard to lay down. Do you know what this is? Thank you.